Warship is a 3-man classic heavy metal outfit from Athens, Greece that has been around since 2003, although the first signs of life date back even further, to 1999 to be exact. Build on the remnants of a band called Kokkalo by Captain Foris Ntrikos, who plays the guitar, the current line-up is completed by Mister Kostas Emmanuilidis on bass guitar and Mister Dimitrios Bechrakis on drums. The vocals are courtesy of the Captain himself. However, judging by the impressive list of past members, their line-up has been all but stable, so it could very well be this has changed since I wrote this. Such a big turnover of personnel almost always has a substantial impact on consistency and productivity of a band, and Warship seems no exception to that rule, at least where productivity is concerned. It might not be the only reason of why Warship’s discography to date is limited to two demos and one full-length, but I have no doubt it must have had at least some influence. As far as consistency goes I have no idea, because up until today I have been completely oblivious to Warship’s existence. Time for an introduction, I’d say. The list of bands that in whatever way have had their influence on their music seems promising, but due to the sheer length and diversity of its contents, ranging from the Beatles to Sepultura, I doubt it will be of any help in advance. That is probably for the best though, allowing me to taste Warship’s vision on classic heavy metal completely unprejudiced. Well, the first taste is a sour one. Opener Fly Like An Eagle sets a tone I cannot appreciate too much, because apparently the guys forgot to tune the guitar resulting in an almost false sounding, out of tune intro which bass nor drums can compensate for. The Captain adds to the overall misery by displaying his vocal qualities, which are mediocre to say the very least. To top it off the production sounds as if this is a release that has been recorded thirty-something years ago in a shady basement a mile south of hell. The hope that Fly Like An Eagle was just a false start and that things will get better quickly goes up in smoke when the second song, called Ready For War, displays the exact same flaws. 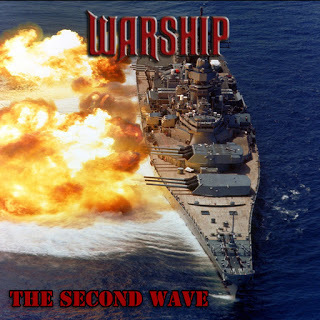 Sounding remarkably familiar this song at least proves the roots of Warship lie in the early days of metal, back when bands like Black Sabbath and Motörhead first started to make name for themselves. By the time the next song, Feel The Pain, is at full throttle it becomes clear all hope that they might still turn things around is forlorn and the reality that this is all there will be dawns on me. Sure enough the entire album, the full 31 minutes spread over eight songs, is filled with the same, simple type of songs with the same flaws. Normally that is more than enough reason to call it a day and discard of the release, but for some reason my mind won’t accept that. I’ll try to explain why. Despite its more than obvious flaws both production- and performance-wise this release has something that kept me from stepping out after the first two songs. It took me a bit to realize what the reason was, but I finally figured it out. It summons feelings of recognition and melancholy reminiscent to my first steps on the path of metal back in the late seventies and early eighties. Though in no way nearing the quality of those releases, the simple yet effective compositions have a strong resemblance to the music from the aforementioned period which is intensified by the ‘old school’ sound of the production. The basic structure of the songs isn’t all that bad, I might even be persuaded to call them potentially pleasant, easy listening sing-a-longs. There’s no inventiveness whatsoever, nor are they very complicated or exciting, but that is not a bad thing by definition. It all depends on execution and I’m convinced that, had the execution been better, much better actually, this album would have gotten significantly higher rates. From me at least. For now though the best I can do is advising you to consider giving this a spin, with the strong advice to try to listen deeper than the first three or four layers. All is not lost, there’s still hope for Warship, but they definitely have their work cut out for them.